After more than 60 years, the bone of an iconic extinct Japanese mammal has been rediscovered by a team of researchers led by the University of Tsukuba. With the help of an old label and local knowledge, two equally possible sites in the town of Tsuchiyu Onsen were identified. The ‘dinosaur’ bone was discovered during construction of a debris dam and identified as the 15.9 million-year-old femur of Paleoparadoxia, a genus of marine mammals. In the spring of 2017, Dr Yuri Kimura, from the Department of Geology and Paleontology at the National Museum of Nature and Science, Tsukuba, found a large bone inside an old wooden box in the geological collection room of the University of Tsukuba, Japan. 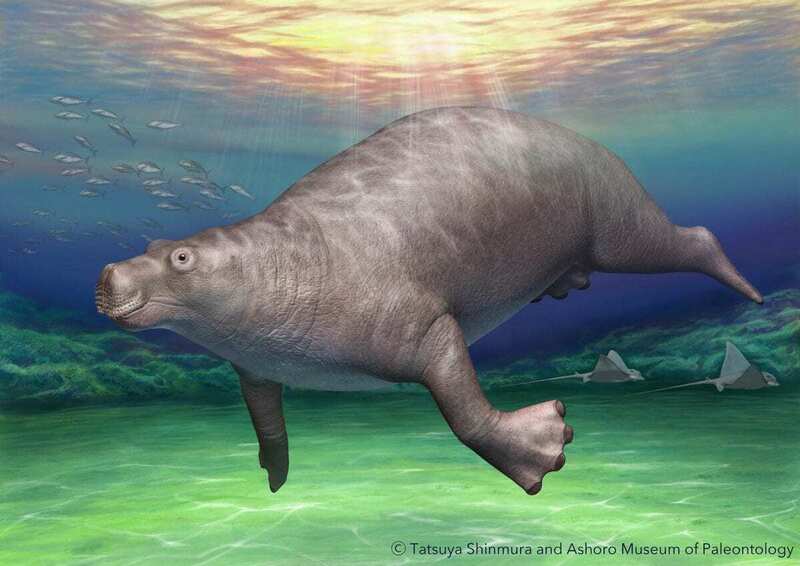 Based on the overall features, she knew the thigh bone (or femur) belonged to an extinct marine mammal, a member of the order Desmostylia, thought to be related to hippo-like rhinoceroses, or sea cows. Dr Kimura teamed up with Dr Kumiko Matsui, one of the few Desmostylia experts, and her colleagues, to reveal the scientific significance of the fossil. As revealed in the journal, Royal Society Open Science, they identified the bone as belonging to the genus Paleoparadoxia. They were large, four-limbed, marine mammals that lived in the North Pacific rim, from Japan to the western coast of the USA and Mexico, 23–10 million years ago. With the help of an old note and local knowledge they also discovered that it was unearthed during dam construction in the town of Tsuchiyu Onsen, near the city of Fukushima. The age of the bone was estimated as 16 million years old or younger. The bone shows well-preserved muscle scars on the surface, making it useful for future studies of the locomotion of the hind limb. By interviewing the local inhabitants, the scientists found two people who knew about the fossil and/or the name on the old label. The fossil was known to be a ‘dinosaur’ bone by locals and was displayed in the village hall until an unknown university teacher took it. A devastating fire destroyed most of the city and the village hall that year. The discrepancy between the date on the old label and the verbal accounts make it impossible to identify the exact location of the fossil. The scientists were, however, able to identify two equally possible locations that are only 350m apart. As Dr Kimura explains, ‘Museum collections are passed down from generation to generation, hopefully for thousands of years or more. For that, specimen information must be tagged with museum materials. We are happy that specimen information was extracted, even after a long hiatus owing to the hand-written note kept with the fossil, as well as the kind help of local people.